The USBLS just released their Mid-Year Update of the Consumer Expenditure Survey covering the period 7/1/2014 to 6/30/2015. As you remember from an earlier post, Pet Food had a great year $26.7B…up $3.8B, but what about the other “Pet Products Partner”…Pet Supplies? 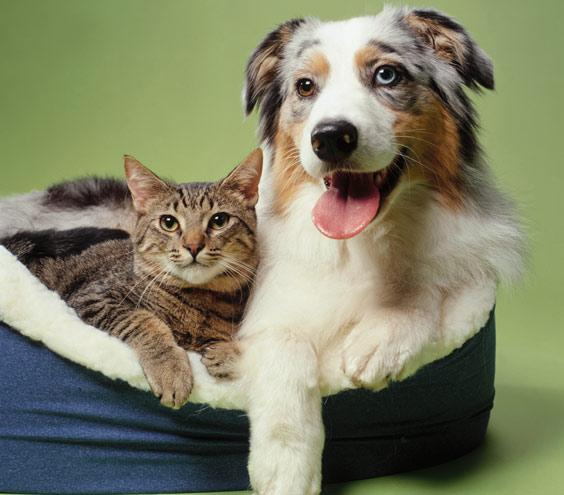 Pet Products account for 67.1% of Total Pet $. What happened in the Supplies segment? 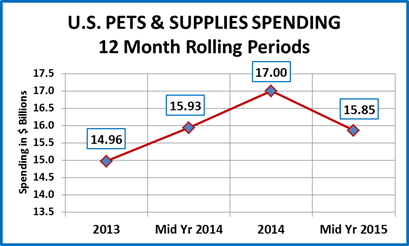 This most recent report shows Pet Supplies Annual spending at $15.85 B, down slightly from a year ago (-$80M). The first chart will help put this decline into perspective with recent history. Mid Yr 2015 vs Mid Yr 2014: Sales down -$0.08B (-0.5%) – basically flat. Prices in the both halves of 2014 were down 1% from 2013. This drove the spending increase in 2014. Prices rose 0.4% in the first half of 2015 vs the same period in 2014…and spending dropped -$1.14B. This pattern of spending hypersensitivity to price may indicate Supplies is truly becoming commoditized. Prices fell -0.3% in Jul>Dec 2015. However, prices were up 1% until the record -2+% drop in November. We’ll have to wait until September to find out if the big price drop in the peak season was enough to pull out an increase or at least a flat year. 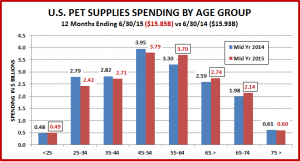 Supplies’spending is down slightly in every age group from 25 to 54, 52% of U.S. H/H’s. The $.7B increase in the spending of the 55>74 group (primarily Boomers) is the only thing keeping supplies’ $ close to even. The H/H Supplies spending for the 75> decreased -5% but the number of H/H’s increased by 600,000, +5% so spending was flat. This is a lot better than their 58% drop in Food spending. The <25 group increased slightly, which is better than a drop but nothing like their 30% increase in Food $. 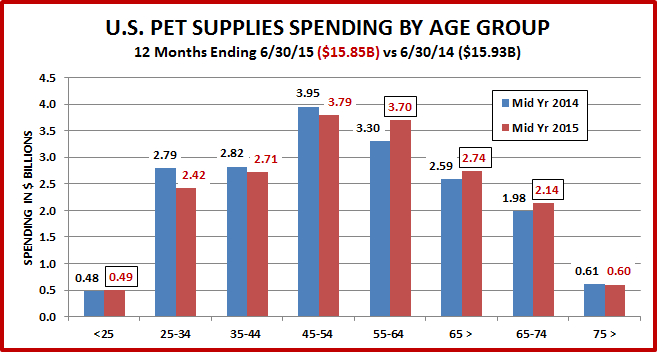 The over $70K group now accounts for more than 55% of Pet Supplies spending. Last year it was 53%. Remember they are only 34.8% of U.S. Households. The look at Supplies Spending by Income Group seems to validate our observation of extreme price sensitivity in this segment. Let’s take a look at this on these two correlating charts. This is a small sample. More research is needed and like almost everything we look at, I’m sure that the situation is more complex than it appears on the surface. However, this segment has been deflating since 2009 and this is a strong indication that a growing number of categories in the supply segment are becoming commodities. A recent report by Blackhawk Engagement Solutions of U.S. women’s shopping behavior found price (75%) as the #1 factor in purchase decisions, followed by quality (55%) and brand (31%). It appears that the Pet Supply segment is reflecting these National trends. Inflation and deflation have the opposite effects on Food & Supplies. Slight inflation generates more Food Spending. If prices fall, people just spend less. On the other hand, Supplies have become so commoditized, that even small price increases seem to depress spending. On Supplies, Consumer’s want a deal! It is definitely a complicated situation! NOTE : I have consolidated this report with the earlier one on Food into a PET PRODUCTS SPENDING UPDATE. If you would like an electronic copy, just send an e-mail request.